Size: 6.0" x 3.5" x 1.7"
Busicom was the brand name used for calculators made by Nippon Calculating Machine Corporation of Japan. 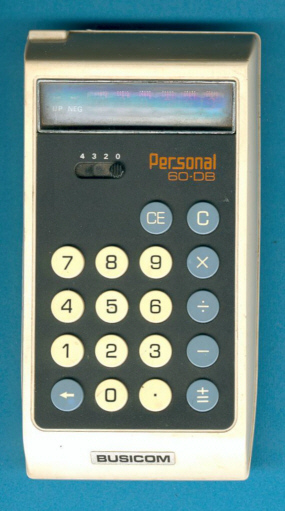 They entered the market of electronic pocket calculators already in the year 1971 with the famous Handy LE-120. The pictured Personal 60-DB still uses the MK6010L, the first single-chip calculator circuit. Please note the NCM logo on the calculator circuit. The internal view of the Personal 60-DB gives an idea of the necessary circuits added to the MOSTEK circuit. The famous MOSTEK MK6011 single-chip calculator circuit. Don't miss the Busicom 100-DA desktop calculator.